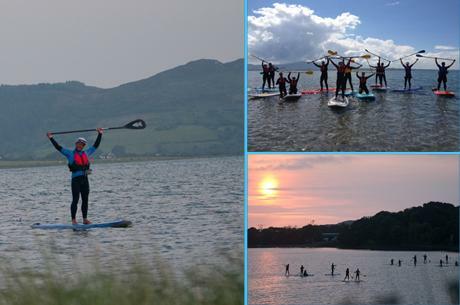 Strandhill Surf School has now introduced Stand Up Paddleboarding, or SUP for short, to its activities. SUP is a fast-growing sport that appeals to everybody. It involves standing on a large, buoyant surfboard and using a paddle to move the board through the water. Ideal if you want to try something new, SUP is an great activity for flat-water conditions. We have a few locations around Strandhill which provide excellent paddleboarding in a picturesque environment. Culleenamore Bay is a beautiful, tidal reserve, home to one of the largest seal sanctuaries around. The pristine waters of Lough Gill, just a short drive from Strandhill, also offers easy paddleboarding with spectacular views of the surrounding forests and mountains. For the more adventurous, flat-water conditions at Strandhill Beach are a great option. This is a great, easy going water-sports activity!